While many readers I have met say they are put off by the confronting nature of Christos Tsiolkas's previous novel, The Slap, I think that the ability to manipulate language in a way that shocks, and a way that communicates the desperation and heartbreak of a situation, is perhaps Tsiolkas's superpower. There are words in his books which I no longer permit myself to say aloud, but it is this taboo I have placed on my own language which helps me understand the strength of emotion which the words convey. (I am, of course, referring to the C-word, which I will refrain from using in this blog post.) 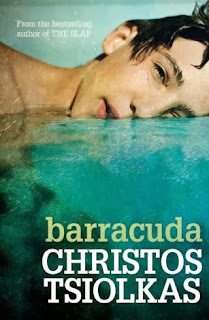 Because Barracuda is a very emotional book. It is about not getting the thing you want most in the world. It is about reaching rock bottom. It is the very opposite of a a fairy tale. It is, for some, real life. Danny Kelly is a swimmer who has the potential to be great. After he is scouted at a swim meet, he receives a scholarship to go to an anonymous Grammar School which he refers to as C***'s College. There, he is ostracized for his ethnicity and his class. The boys at the school have been together since pre primary, and call one another by their surnames, because, as is pointed out near the end of the book, your first name does not matter as much as your families. Money talks. But Danny is determined, and under the coaching of Frank Torma he learns to be tough and give as much as he gets. Soon, he is Barracuda. The water loves him and he is the strongest, the fastest and best. The boys who taunted him, in particular Martin Taylor, become his best friends. While Danny retains his outsider's viewpoint, he is blind the fact that he is becoming one of the golden boys. He acts like them, thinks like them and behaves like them, although we see that he has a greater propensity for kindness in him than the others seem capable of. This drives him away from his family. He is, in effect, a brat, and when he fails to win a key race, I cannot say that I feel sorry for him, although I can relate to his disappointment. Where to from there? It is a long way back to normal. This book is crafted in a way which is experimental, but it works. The chapters alternate, telling the story from both first person and third person, one narrative moving forward in time and the other moving backwards. It is skillfully done. At no point did I feel lost or confused. The order was almost natural, and it was like swimming through time. I felt like I was in the water with Danny, and his despair drove me there also. Honestly, I could not stop reading this book, and when I had to, I thought about it. It was powerful and it hit home. It fed on my secrets doubts about my future and my public school past. It is a difficult book to review, as I could talk about it for hours but I want you to experience it for yourself, so please do. A great review Elimy, I liked this book too though I thought it was perhaps a touch overlong.